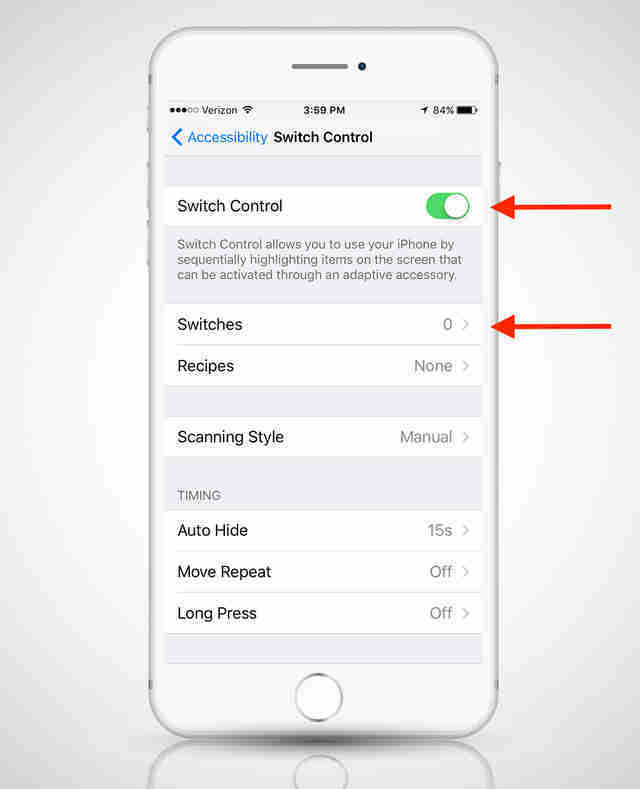 Apple loves to flaunt all the flashy new features it bakes into its latest phone software, but each rollout also comes with a whole set of hidden customizable functions -- many of which are tucked away in the Accessibility settings -- that can vastly improve the ways you use your iPhone. Here's a taste of the good stuff you might be missing out on. Apple has a wide range of specialized features for users with limited mobility that can radically change the queues you use to control your phone. One of the coolest is the Switch Control feature, which transforms your camera into a motion sensor that will activate certain functions -- for example, you can bring up Siri by turning your head to the right. The set-up is a little involved, but here's how to do it: go to Settings > General > Accessibility > Switch Control. Here, turn on Switch Control, tap Scanning Style, and select Manual. Then, tap Switches > Add New Switch > Camera > either Left or Right Head Movement > and select your desired function (you have your pick from eight functions, including Siri, the App Switcher, and the Home button). Now, any time you turn your head, you'll activate what you picked (and when it inevitably gets annoying, just tap the Switch Control radio button off). When you absolutely need to know when you're phone's ringing or you receive a text, but neither audible alerts nor vibration will do, you can set your phone's flash to light up like a strobe to get your attention. To activate it, go to Settings > General > Accessibility then scroll down and turn on LED Flash for Alerts. A double-tap of your Home button let's you scroll through all your open programs, but you can also set up a triple-tap to activate night-reading mode. Looking at bright screens before bed screws up your sleep patterns, so night mode is a lot easier on the eyes when you're using your phone in low light. 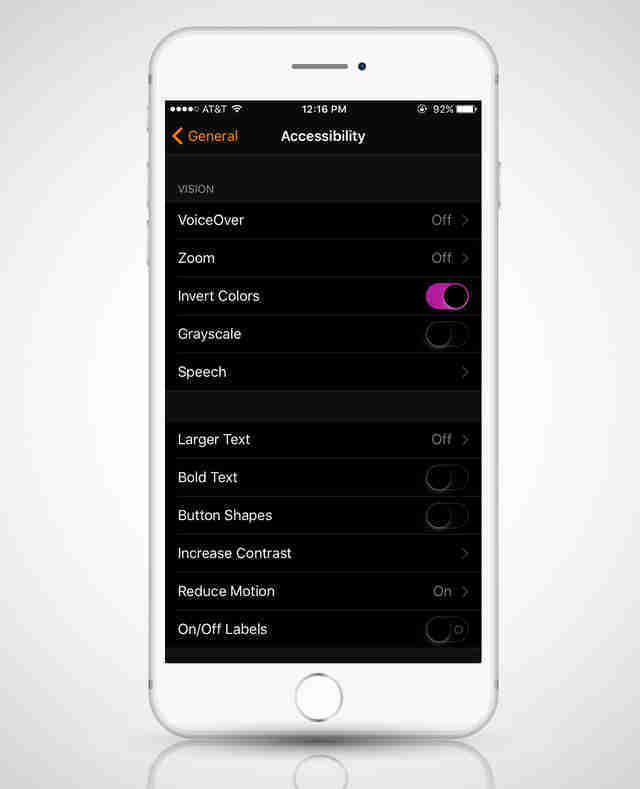 Go to Settings > General > Accessibility, scroll to the bottom and select Accessibility Shortcut, then tap Invert Colors. Now, any time you triple-tap you'll invert the screen's colors. Rather than waste your energy typing frequently used phrases like "I'll be there soon!" or "Where did all this blood come from? ", you can program your keyboard to recognize custom abbreviated shorthand so it will autocomplete particular words, names, and expressions. It's also super helpful to stop autocorrect from ruining the swear words in your texts. To set them up, go to Settings > General > Keyboard > Text Replacement, and go wild. Just like you can assign different ringtones for each of your contacts, you can set up custom vibration patterns to help you slyly recognize who's texting or calling when you're at dinner or in a meeting without removing your phone from your pocket. Go to the contact you want to set, click Edit > Vibration > Create New Vibration, and tap out the specific pattern you want affiliated with that person. You can also set these vibrations for other apps and notifications, like calendar events, by going to Settings > Notifications > Calendar > Upcoming Events > Sounds > Vibration > Create New Vibration. 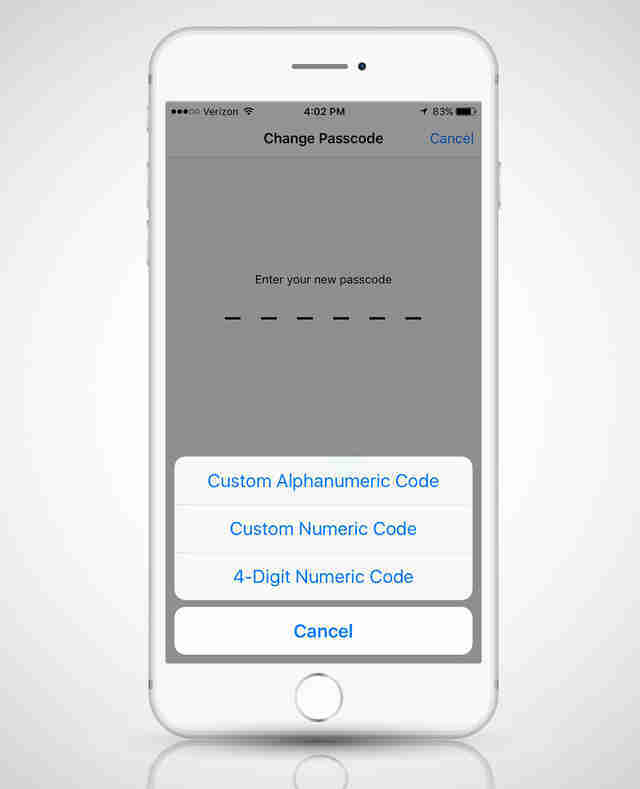 Worried your four- or six-digit numeric passcode is just too easy to crack? 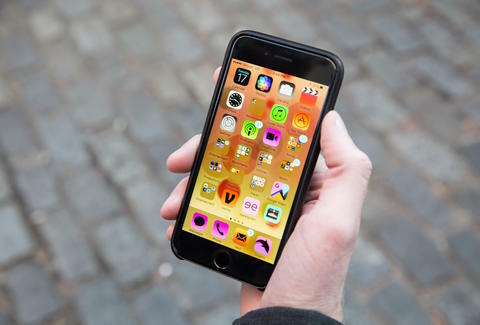 Gather 'round privacy freaks, we come bearing good news: you can create a custom alphanumeric passcode as long as your heart desires, as long as you're willing to type in those same 55 characters in their precise order every time you feel the urge to check Instagram. To Fort Knox-ify your device, go to Settings > Touch ID and Passcode > Change Passcode > tap Passcode Options > select Custom Alphanumeric Code. Ever been scrolling down a webpage on your phone and wished it would just scroll itself? We're busy people, and a few seconds saved here and there add up, ya know? Go to Settings > General > Accessibility > AssistiveTouch and slide to turn it on. You'll notice a blurry translucent dot appear on the lower right of your screen -- don't freak out, you're on the right track. Next, tap Create New Gesture, and in the open area, slowly move your finger on the screen from the button toward the top, as if you were scrolling through a long email or article. Click Save, and label the gesture "Scroll." Now, select Customize Top Level Menu, tap the Custom button, select "Scroll," and your new function is added. To activate it when you're reading something, tap the translucent dot, select "Scroll," then tap the smaller dot that pops up in the bottom of whatever page you're on and enjoy some sweet, sweet auto-scrolling. This is admittedly a little advanced and complicated, so if you're looking for a little more guidance, check out this video. Joe McGauley is a senior writer for Thrillist. His favorite custom vibration is bzz bzz bzzzzzzzz.